Abby decided to major in history in college after she did a job shadow at a museum while in high school and fell in love with the experience. She has since added a philosophy minor and is interested in graduate school and working in public history. An Honors Program student, Abby was awarded a scholarship for her participation in music and has several campus jobs. 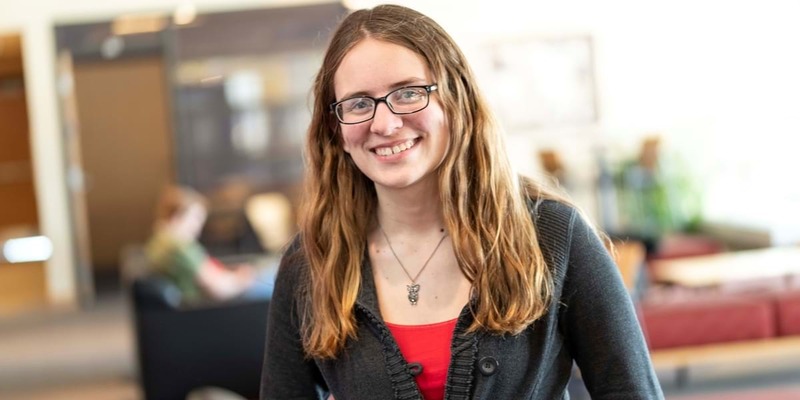 She serves as a teacher’s assistant to Dr. Mike Kugler in the history department, works in the audiovisual department, and writes for the student newspaper. My history major has changed the way I think and look at the world. I’m much better at thinking critically and organizing details into a coherent whole than I was coming in as a freshman. Even if my career path should take unexpected turns in the future, I think these skills will be very useful. Everyone seems to think that studying history means learning facts and dates, but that is absolutely not the case. History is a puzzle. We’re given bits and pieces—remnants of the lives lived before us—and we try to make sense of them. Most of the time we can have a good idea of what life was like and what people were like, but there are still things to discuss and to study, and it's fascinating! This is also significantly more useful than memorizing facts and dates, because we are not only making sense of the past; understanding history is how we come to understand the present. Northwestern professors integrate faith and learning in many different ways, but often they will present you with a problem and ask you to wrestle with it. In a history class, you might be asked to look at the religion of a variety of people at a specific time; in a philosophy or religion class, you'll be presented with ideas that you must make sense of; in a psychology class, you'll look at the best theories of the psychology of religion. It's really fascinating and challenging to look at faith from so many angles, and through it, we can grow in our faith and better understand our beliefs. There are some troubling stories in history. Throughout my classes, I've had to make sense of the corruption of religion in various times and places and to read and understand religious leaders. Sometimes it can be very troubling to learn about people who called themselves Christians and yet did not follow Christ's example. That makes me take a good long look at myself and whether I follow Christ's example. What makes Northwestern ideal is 1) It’s a Christian college, so you can find friends who can help you grow in your faith, and 2) It's small enough that you can makes friends of all kinds—and you can even become good friends with professors!